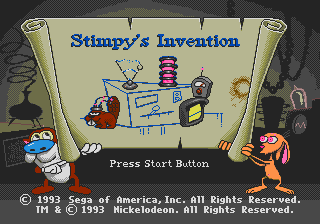 The Ren & Stimpy Show Presents Stimpy's Invention is a 1993 game for the Sega Mega Drive by BlueSky Software and Sega based on the Ren & Stimpy cartoon. The game combines standard action platforming with a few gimmick stages such as a flying or riding a bike. Curiously, the game lacks a final boss. Instead, a weird machine built by character Stimpy must be disabled by pushing 4 switches . The game can be played cooperatively or alone, similar to World of Illusion. is for far jumps, running or digging, is for attacks and is for standard jumps. In single player mode, the active character can be swapped by pausing the game and pressing . The inactive character is invincible and can be used as a shield. A bonus life is awarded for collecting 50000 points. Main article: The Ren & Stimpy Show Presents Stimpy's Invention/Magazine articles.